Feeling like a little hike on the day after Christmas. Marie, her son, Aaron, June and John headed into the Coronado National Forest for a short walk or climb. The weather was going to be great, clear skies and 72 to 77 degrees for the high. We drove up into the park as far as we could and parked the truck, at 5,400 feet elevation, grabbed our packs, and headed for one of the trails, called "Old Baldy". We all wondered just how far we could go, could we get all the way up to the top? This trail is mostly up traveling through the trees, winding our way up, and UP. Aaron was the point man, periodically jogging ahead, making sure the way was safe. (OK, he was looking for a place for the rest of the athletes to take a break) Seeing that all of us are in peak condition, we took a number of breaks, just to view the scenery. (YES, we also gulped water and caught our breath, too.) The snow from a few days earlier, was still on the trail, in a few areas, making things a little slippery. We made it to the saddle (this is an area between two mountain peaks) Mt Wrightson was to our left 9,543 high and Mt Hopkins, at 8585 feet, was to our right. Mt Hopkins is where the Whipple Observatory is. This short sprint took 2 1/2 hours, traveled 2 miles, and got us to just over 1,600 feet above the truck or 7,000 feet of elevation. It was time for a rest, not that we needed it. While we rested we also had lunch. While lounging we ate our lunch of vegetables, fruit, and smoked oysters. O nce recovered and refreshed, we all (With the exception of Aaron) thought it would be a good idea to walk back down this little hill, not that we couldn’t climb another 2,543 feet to the top of Mt Wrightson! It only took a little over an hour to get back down. Now what is it that rolls down hill? Hmm, I forget. When we started the truck we noticed that the outside temperature was 67 degrees, as we drove back down to Green Valley the temperature continued to climb to 77 degrees. A little altitude sure makes a difference in temperature. Safely back at home it was time to rest UP. We would like all of you to be seated. With our folks singing in the church choir, on Christmas Eve, June and John attended the 10:30AM service. John was very nervous, with the Church ceiling trembling as he walked in. We all got through the service and enjoyed the choir very much. The roof even stayed up. We all met at Marie and Vic's at about 5:00PM for a snack and beverage before the 7:00PM candle light service, with sister, Marie singing a solo. This is when John found out that there was going to be a communion and having never been baptised, could not partake. Sister, Marie, jumped right in, put her hand under the kitchen faucet, put her wet hand against John's forehead and baptised him. Upon entering the church, at 7:00PM, ceiling once again, trembled, a little dust fell on John's head, but it stayed up. Marie did a wonderful job and even got some applause in church. John even received his first communion from his Mother, Dorothy! We adjourned for some Christmas cheer to Marie and Vic's. Christmas morning brought gifts to the home on wheels. A mp3 player for June, socks and a BIGGER WRENCH for John. When we got back to camp the parts had arrived. I had already cleaned the gear box housing of all the broken teeth and metal shavings. The gears were held in place with pins that had to be driven out with a punch and hammer. The reassemble process began with installing the smaller gear, driving the new pin in, which holds it in place on the shaft. Now for the larger gear. This pin was a little stubborn, using a punch and a hammer it was taking a lot to get the pin into place. I needed a bigger hammer as I was swinging it very hard. Then it happened, I missed the punch. No I didn’t ruin any pieces with the hammer, my hand stopped the hammer. No blood was drawn and I continued on with the process of hitting the punch, slowly driving the pin in. Not wanting to do that again, I wrapped my hand in a towel and got the pin the rest of the way in. Now I had to reinstall the gear box to the motor and put the unit back into the trailer. This is done from the bottom of the trailer, through an access hole, made for a midget. I had June push the button…..you may not believe it, but it worked perfectly. This time when the motor ran the slide out moved in. We were ready to head out in the morning. It only took 1 ½ hours to put it back together, including swear time. I did have to make a change in my habits. In order to twist off a beer cap I use my good hand. The other is still tender. With the parts on order for the slide out we thought we should make a visit to White Sands. White Sands is 275 square miles of pure white gypsum sand.Rain runoff from the area collects at one end in a lake and as it dries forms crystals that break down into gypsum sand, then blow across the region, moving up to 30 feet a year. After some hiking on the dunes we headed back to Las Cruces. Well, you guessed it, we were off to Las Cruces, making it there with out a hitch. 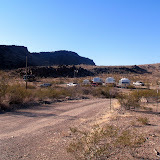 When we got checked in and backed into this really poor site, with unobstructed view of the City and Organ Mountains, 50 amp service, and gazebo with Christmas lights right next to us. Now, don’t you feel sorry for us? I suppose you were wondering if the slide out came back out? Seems as though the crescent wrench that John has, wasn’t big enough to turn that shaft, being only 10 inches long. Now what? On Monday John called the repairman who wanted us to research who makes the slide out unit. A call was made to the manufacturer and the problem described. John was told it was an easy fix and if there was any problems, just call them back. Cool, parts are on the way (over nighted ). OK, can John get the unit out and apart? You bet’cha, in 2 ½ hours it was out and the stripped gears were in hand. Our next stop was the sand dunes of Monahan, a State Park west of Odessa. This is kind of out in the middle of no where. As the living room slide went out there was a loud bang, just as it got all the way out. It was the sound of the teeth breaking, on the motor that runs the slide in and out!!!!!!!!!! Not wanting to run the slide back in and be stuck with it in, and late in the day we left it alone. The next morning we packed up and tried to get the slide to come in…………….. Nothing doing, it wasn’t moving! Just the sound of the motor running and nothing happening. John climbed up on one of the dunes, to get a cell phone signal and called the office to see if they knew someone who could help. The office said, they would research it and send Ranger Bob out with the information. Looking at all the sand and deciding that we did not want to be broke down here, something had to be done. Marie and John pushed on the slide while June held the button in for the slide. Behold the slide moved in, it was working! Until, we got to the last 6 inches, where it stopped! Pushed as hard as we could, but it was not moving. Traveling like this was not a good idea. Ranger Bob showed up and three of us pushed on the slide, still nothing. Now what? Luckily Ranger Bob had a LARGE crescent wrench in his truck. Ranger Bob and John crawled under the trailer and used it to turn the shaft by the slide out motor and success! Moving on, for those of you who have been following our travels the last four winters you may recall us being broke down in Las Cruces, New Mexico, with our Coachman trailer for a week. We packed up our trailer and left the Arch heading south, (looking for warmer temps) toward Memphis. After passing through Memphis we made our way to Little Rock , Arkansas. After a brief stop at Wal Mart we pulled into a park for the night. From there we moved on to Grape Vine, Texas, which is on the north side of Fort Worth. After setting up in the city park the girls went shopping while John took it easy. We found a campground at The Casino Queen, full hook ups, 50 amp, for $24. And of course we had to pay a visit to the Arch. Catching the Metro Tram in front of the Casino made it easy to get to the Arch and downtown.The Arch symbolizes the gateway to the West, with the Louisiana Purchase. The entrance to the Arch, which is a National Park, is located underground, between the Arch base legs. The Park also contains an Imax Theater, featuring the Louis and Clark expedition and a museum. After leaving the Arch we found our way to a Micro Brewery for some lunch and a wee bit of beer. Then it was on to Union Station. It’s the old train station converted in to a shopping mall. AND, believe it or not, the girls did not buy anythin g and no one ever went into the Casino. Monday morning, the 4th, at 6:00AM, we pulled out of the heated barn and headed south. While it was cold, 25 degrees, it didn’t seem too bad. But, the further south we went, the colder it got, 15 degrees south of Grand Haven. It didn’t warm up until we got to St Louis, Illinois, if you call 42 warm. June and I left home on December 2nd and made our way to Ludington, Michigan to pick up my sister, Marie. The further west we went the more snow we found. They had a foot of snow on the ground in Ludington and more coming down. This area is known for its “Lake Effect Snow”. My brother in law, Vic has access to a large heated barn and managed to get our rig tucked inside. Saturday night Marie was starring in a local theater performance of the musical comedy Nuncrackers, which June and I thoroughly enjoyed. 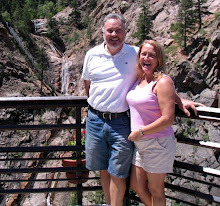 The 3 of us will be traveling to Green Valley, Arizona, where we will meet up with Vic. All of us will spend Christmas with my folks.